Double-sided, 4'' x 4'' cards. 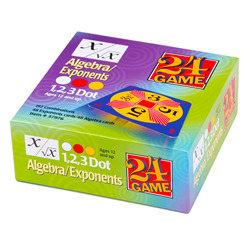 Deck contains 48 Exponents 1 Dot, 2 Dot and 3 Dot cards, 48 Algebra 1 Dot, 2 Dot and 3 Dot cards. Three levels of challenge. Cards offer three levels of difficulty. Easy, 1 Dot cards are easy, 2 Dot cards are medium and 3 Dot cards are tough. How to play Algebra. Find a value for x and/or y (any whole number 1 to 9) which, when used together with the other numbers on the card can make 24. You can add, subtract, multiply and divide. Use all four numbers (or number equivalent of the algebraic notation), but use each number only once. How to play Exponents. Object of the game is to make 24. You can add, subtract, multiply and divide. Use all four numbers on a card, but use each number only once. Cards in this edition may not be solved without using an exponential operation, and you may use ONLY ONE exponential operation. You can square, cube, take the square root or cube root of a number on a card or a computed number.